We thought that it might be fun to do a style comparison this month and show you a second interpretation of a classic pilsner. Market Street Pilsner is an authentic Bohemian style pilsner and Gold Medal winner at the 1996 World Beer Championships. It is brewed with 2-row pale and Munich malts, balanced out with Nugget, Perle, Czech Saaz, and Hersbrucker hops. It is on the dark end of the spectrum for pilsners, coming in at a deep gold color. Look for a frothy white head and a pleasant Saaz hop aroma. This pilsner is slightly sweet, with a malty body and light hoppy finish. With a perfect balance of malts and hops, you .ll understand why this is a gold medal winner. 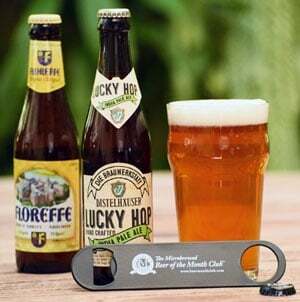 Try pairing this beer up with the seafood fest recipe in this newsletter! This is a serious recipe for serious appetites. What more could you want? You got your potatoes, your shellfish, your fatty fish, your meaty fish, some nice spice and a vegi to boot. And of course, one of the best handcrafted Pilsners in the country. So what are ya waitin' for Emeril? Get busy! Cook potatoes thoroughly in salty water. Cook asparagus al dente in salty water, then refresh in iced water. Cut each fish fillet in 4 slices and season with salt and pepper. Butter bottom of a lg. Sauce pan, add fish pieces plus the 8 oysters and pour the beer and caraway seeds into pan. Bring to boil, cover and reduce heat. After 2 min., add potatoes and mussels. Cover and let simmer until mussels open. Remove the fish, shellfish and potatoes to a deep plate. Bring the remaining liquid to a boil. With a whisk, gently introduce the cold butter to the liquid a little at a time. Turn the flame on and off to keep the butter from breaking. Add the asparagus to the liquid and pour over the seafood. Sprinkle with fresh parsley and proceed to inhale food in mass quantities. Recline to the couch and pop in “"Josey Whales or Cool Hand Luke" if your feeling tough, "Raising Arizona or Best of Show" for a good laugh and "9 ½ weeks" if you're feeling lucky! Do not attempt to clean kitchen. I've heard folks talk about some beers being "top fermenting" vs. "bottom fermenting"” before. Can you tell me what the difference is? Call me clueless! Yo Robbie, Bob, Robert, Bob-O! Remember that guy? "You can call me Ray. Or you can call me Jay. Or you can call me Ray-Jay. Or your can call me Jay-Ray. But ya doesn't have ta call me AJ" ! Okay, maybe that wasn't it 'cause I remember it being a lot more funny than what I just read back to myself. Maybe it would have been funnier if I used your name. Nope. Just tried it and it's still not funny. 70's comedy. We used to think Sonny Bono was funny then too. Go figure. Okay. Here it is Wittleman. There are two basic categories of beer styles: Ales which are top-fermenters beer and lagers, which do that fermentation thang on the bottom. Generally speaking, top-fermenting beers are more complex with fruity characteristics, and bottom-fermenting beers tend to be cleaner. Some of your basic top-fermenting beers include hefeweizens, stouts, porters, India pale ales, red ales, and pale ales. 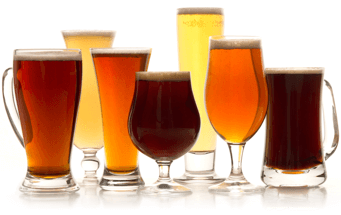 Common bottom-fermenters include: bocks, marzens, pilsners, amber lagers, and malt liquors. Does that help clear it up for ya Inspector Clouseau?